Since most Windows 10 users obtained their version of the latest Microsoft operating system as an upgrade from a previous version, there isn’t a built-in recovery system, if your PC or other device is disabled. You would have to revert to that previous operating system and re-download Windows 10. Unfortunately, if that occurs past Windows 10’s first year on the market, that download won’t be free. To potentially save some money down the line and a significant hassle, it is a good idea to create your own Windows 10 recovery drive to re-install the operating system in the case of a system disaster. A simple way to do this if you upgraded via the media creation tool is to use that same tool to create a recovery drive on removable media, such as a disc or USB flash drive. To do this, run the tool, click whether you have a 64-bit or 32-bit system, and choose ‘Create installation media for another PC’ from the available options. This directs you to a screen asking what language you prefer and which version of Windows 10 you currently use. Make the appropriate selections, and you will be walked step-by-step through the rest of the process. Another method to create a Windows 10 recovery drive is to use the Recovery Options within the Control Panel. With previous versions of Windows, this feature was a tad easier to locate, but it still lurks in the background for you to find. From the Start menu, you can open Settings and then type Recovery in the top right dialogue box to reveal an option to ‘Create a Recovery Drive’ before following the steps to complete the action. Alternatively, you can just type Recovery Drive into Cortana’s search field on the bottom left of your screen. With either method, choose to back up your system files, and you will be directed to insert your media after a short wait for a systems check. 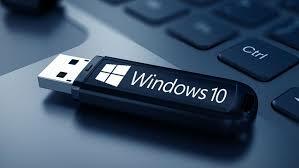 You will need at least 4GB of space on your disc or USB drive and bear in mind that any other information already on it will be erased with the addition of the Windows 10 recovery drive. This process will take a while, but you are able to continue working as your device copies everything onto your removable media.